Conjugated Linoleic Acid (CLA) has been shown to reduce cholesterol levels. Preliminary studies in humans suggest potential anticancer effects. CLA is commonly found in dairy products and beef, and is made by microbes that live within the gut of certain animals. It is found throughout the body and may regulate cholesterol levels and help disrupt cancer cell replication. Although CLA is marketed as a weight loss product, studies show mixed results. Animal studies have shown that CLA has antioxidant properties and may reduce the spread of cancer. Preliminary studies in humans suggest potential anticancer effects. However, clinical trials to confirm safety and effectiveness are needed. Studies show that while CLA reduces total cholesterol levels, it also reduces HDL, or good cholesterol levels. CLA may improve body fat mass in some people, but results are mixed, and CLA may actually be harmful in some populations. For example, in obese men with metabolic syndrome or at high risk for heart disease, CLA supplementation decreased insulin sensitivity / caused insulin resistance. You are taking blood-thinning drugs (eg, warfarin): CLA may increase the effects of anticoagulant and antiplatelet drugs, increasing the risk of bleeding. You have diabetes: In obese men, CLA has caused insulin resistance and may increase blood glucose levels. You have heart disease: In patients at risk for cardiovascular complications, it may increase processes that cause cell damage. Conjugated Linoleic Acid (CLA) is a naturally occurring fatty acid found in the milk and meat of ruminant animals (22). CLA supplements have been marketed for weight control and to lower high cholesterol. Other purported uses include cancer prevention. CLA has different isomers that appear to have distinct characteristics, with anti-carcinogenic effects more likely attributable to cis-9,trans-11 and anti-obesity effects attributable to the trans-10,cis-12 (23) isomer. In humans, studies of potential benefits of CLA are mixed. CLA supplemenation may have antithrombotic or antiatherosclerotic effects (24). However, in obese men at high risk for cardiovascular disease, cis-9,trans-11 CLA supplementation decreased insulin sensitivity (25). Another study suggests no significant effects on antioxidant metabolism in healthy overweight/obese individuals (26). CLA may ameliorate inflammatory bowel disease (20) and improve airway hyperreactivity in asthmatic individuals (21). Short-term high CLA intake did not affect blood pressure regulation (27). Data from studies on CLA-induced changes in body composition and weight reduction are also mixed. Some studies yielded positive results (28) (29) (30) while others do not show benefits (31) (32) (46). Several double-blind RCTs have evaluated whether CLA can have additional effects on exercise performance. One study did not find any impact of CLA on aerobic capacity (33), and another determined that CLA did not improve aerobically-induced neuromuscular fatigue (34). However, CLA was shown to have triacylglycerol-lowering effects both on its own (22) and along with aerobic exercise (35), although it did not have any effect on other lipoprotein risk factors (22). Animal studies suggest that CLA may play a role in reducing tumor proliferation in certain cancer cell lines (2) (3) (4). In models of colorectal cancer, CLA reduced inflammation and decreased disease activity (36) (37). Preliminary human studies suggest anticancer effects with CLA in colorectal (38) and breast (39) cancers. More studies in the context of clinical trials are needed. Reported adverse events include minor gastrointestinal symptoms (9) and severe fatigue (6). Of several possible CLA isomers, cis-9,trans-11 and trans-10,cis-12 are the main isomers found in meat and dairy products, as well as commercial supplements. They appear to have distinct characteristics, with anti-carcinogenic effects more likely attributable to cis-9,trans-11 and anti-obesity effects attributable to trans-10,cis-12 (23). CLA reduced prostaglandin synthesis, especially PGE2 (12) (13), and decreased stearoyl-CoA desaturase activity (14). The trans-10,cis-12 isomer decreased serum HDL cholesterol levels (9), inhibited stearoyl-CoA desaturase activity (12), and decreased insulin-like growth factor-II secretion at both transcriptional and post-transcriptional levels (18). Laboratory and animal studies suggest that CLA has both anti- and pro-oxidant effects (40) (41). CLA may reduce abdominal adiposity through increased energy expenditure, while myocardial oxidative stress may occur through changes in transmembrane potential or the antioxidant defense system (40). In humans, CLA appeared to have a synergistic effect with a mixture of oleic and erucic acids in reducing neuroinflammation and enhancing peroxisomal beta-oxidation (42). In human skeletal muscle, CLA enhanced the rate of glycogen resynthesis after exercise (43). It is thought that replacing other polyunsaturated fatty acids (PUFAs) with CLA may reduce oxidative stress and modulate intracellular signaling (11). These effects may inhibit carcinogenesis and affect cellular responses to tumor necrosis factor-alpha (TNF-alpha) (15). In vitro, CLA inhibited MCF-7 breast cancer cell proliferation, but the mechanisms by which this occurred for both isomers (trans-10,cis-12 and cis-9,trans-11) differed and require future elucidation (3). The cis-9,trans-11 isomer induced tissue inhibitor of metalloproteinase (TIMP)-1 and TIMP-2 mRNA in SGC-7901 human gastric carcinoma cells, which may play a role in inhibiting the tumor metastasis cascade (2). This inhibition may come from blocking the cell cycle with reduced expressions of cyclin A, B1 and D1 and enhanced cyclin-dependent kinase inhibitor (CDKI) expression (17). In animal models of colorectal cancer, suppression of disease activity was attributed to peroxisome proliferator-activated receptor gamma (PPARy) activation (36). Other possible mechanisms include increased apoptosis and enhanced caspase-3 activity in the colon mucosa (37). Preliminary studies in human breast cancers suggest anticancer effects occurred through suppression of fatty acid synthesis (39). In rectal cancer, CLA supplementation may improve markers of inflammation, and reduce angiogenesis and tumor invasion via matrix metalloproteinase-9 inhibition (38) (44). The cis-9,trans-11 isomer may modify platelet activation and aggregation, and displayed anticoagulant properties (24). CLA should be used with caution in patients who have cardiovascular disease or diabetes, as it has increased lipid peroxidation and caused insulin resistance / decreased insulin sensitivity (9) (25) (45). Fatigue, gastrointestinal symptoms (6) (9). Anticoagulant/antiplatelet drugs: The cis-9,trans-11 isomer has also been shown to have anticoagulant/antiplatelet activities (24). It may increase the effect of drugs with similar properties. D’Orazio N, Ficoneri C, Riccioni G, Conti P, Theoharides TC, Bollea MR. Conjugated linoleic acid: a functional food? Int J Immunopathol Pharmacol. 2003;16:215-20. Chen BQ, Yang YM, Gao YH, Liu JR, Xue YB, Wang XL et al. Inhibitory effects of c9, t11-conjugated linoleic acid on invasion of human gastric carcinoma cell line SGC-7901. World J Gastroenterol. 2003;9:1909-14. Chujo H, Yamasaki M, Nou S, Koyanagi N, Tachibana H, Yamada K. Effect of conjugated linoleic acid isomers on growth factor-induced proliferation of human breast cancer cells. Cancer Lett. 2003;202:81-7. Ip MM, Masso-Welch PA, Ip C. Prevention of mammary cancer with conjugated linoleic acid: role of the stroma and the epithelium. J Mammary Gland Biol Neoplasia. 2003;8:103-18. Miner JL, Cederberg CA, Nielsen MK, Chen X, Baile CA. Conjugated linoleic acid (CLA), body fat, and apoptosis. Obes Res. 2001;9:129-34. Blankson H, Stakkestad JA, Fagertun H, Thom E, Wadstein J, Gudmundsen O. Conjugated linoleic acid reduces body fat mass in overweight and obese humans. J Nutr. 2000;130:2943-8. Petridou A, Mougios V, Sagredos A. Supplementation with CLA: isomer incorporation into serum lipids and effect on body fat of women. Lipids. 2003;38:805-11. Smedman A,.Vessby B. Conjugated linoleic acid supplementation in humans—metabolic effects. Lipids. 2001;36:773-81. Riserus U, Arner P, Brismar K, Vessby B. Treatment with dietary trans10cis12 conjugated linoleic acid causes isomer-specific insulin resistance in obese men with the metabolic syndrome. Diabetes Care. 2002;25:1516-21. Mougios V, Matsakas A, Petridou A, Ring S, Sagredos A, Melissopoulou A et al. Effect of supplementation with conjugated linoleic acid on human serum lipids and body fat. J Nutr Biochem. 2001;12:585-94. Belury MA. Conjugated dienoic linoleate: a polyunsaturated fatty acid with unique chemoprotective properties. Nutr Rev. 1995;53:83-9. Pariza MW, Park Y, Cook ME. Mechanisms of action of conjugated linoleic acid: evidence and speculation. Proc Soc Exp Biol Med. 2000;223:8-13. Ma DW, Field CJ, Clandinin MT. An enriched mixture of trans-10,cis-12-CLA inhibits linoleic acid metabolism and PGE2 synthesis in MDA-MB-231 cells. Nutr Cancer. 2002;44:203-12. Choi Y, Park Y, Storkson JM, Pariza MW, Ntambi JM. Inhibition of stearoyl-CoA desaturase activity by the cis-9,trans-11 isomer and the trans-10,cis-12 isomer of conjugated linoleic acid in MDA-MB-231 and MCF-7 human breast cancer cells. Biochem Biophys Res Commun. 2002;294:785-90. Pariza MW, Park Y, Cook ME. Conjugated linoleic acid and the control of cancer and obesity. Toxicol Sci. 1999;52:107-10. Banni S, Angioni E, Casu V, Melis MP, Scrugli S, Carta G et al. An increase in vitamin A status by the feeding of conjugated linoleic acid. Nutr Cancer. 1999;33:53-7. Liu JR, Li BX, Chen BQ, Han XH, Xue YB, Yang YM et al. Effect of cis-9, trans-11-conjugated linoleic acid on cell cycle of gastric adenocarcinoma cell line (SGC-7901). World J Gastroenterol. 2002;8:224-9. Cho HJ, Lee HS, Chung CK, Kang YH, Ha YL, Park HS et al. trans-10, cis-12 conjugated linoleic acid reduces insulin-like growth factor-II secretion in HT-29 human colon cancer cells. J Med Food. 2003;6:193-9. Herbel BK, McGuire MK, McGuire MA, Shultz TD. Safflower oil consumption does not increase plasma conjugated linoleic acid concentrations in humans. Am J Clin Nutr. 1998;67:332-7. Bassaganya-Riera J, Hontecillas R. Dietary conjugated linoleic acid and n-3 polyunsaturated fatty acids in inflammatory bowel disease. Curr Opin Clin Nutr Metab Care. 2010 Sep;13(5):569-73. MacRedmond R, Singhera G, Attridge S, et al. Conjugated linoleic acid improves airway hyper-reactivity in overweight mild asthmatics. Clin Exp Allergy. 2010 Jul;40(7):1071-8. Gebauer SK, Destaillats F, Dionisi F, et al. Vaccenic acid and trans fatty acid isomers from partially hydrogenated oil both adversely affect LDL cholesterol: a double-blind, randomized controlled trial. Am J Clin Nutr. Dec 2015;102(6):1339-1346. Subbaiah PV, Gould IG, Lal S, et al. Incorporation profiles of conjugated linoleic acid isomers in cell membranes and their positional distribution in phospholipids. Biochim Biophys Acta. Jan 2011;1811(1):17-24. Bachmair EM, Bots ML, Mennen LI, et al. Effect of supplementation with an 80:20 cis9,trans11 conjugated linoleic acid blend on the human platelet proteome. Mol Nutr Food Res. Jul 2012;56(7):1148-1159. Riserus U, Vessby B, Arnlov J, et al. Effects of cis-9,trans-11 conjugated linoleic acid supplementation on insulin sensitivity, lipid peroxidation, and proinflammatory markers in obese men. Am J Clin Nutr. Aug 2004;80(2):279-283. Kim J, Paik HD, Shin MJ, et al. Eight weeks of conjugated linoleic acid supplementation has no effect on antioxidant status in healthy overweight/obese Korean individuals. Eur J Nutr. Mar 2012;51(2):135-141. Engberink MF, Geleijnse JM, Wanders AJ, et al. The effect of conjugated linoleic acid, a natural trans fat from milk and meat, on human blood pressure: results from a randomized crossover feeding study. J Hum Hypertens. Feb 2012;26(2):127-132. Carvalho RF, Uehara SK, Rosa G. Microencapsulated conjugated linoleic acid associated with hypocaloric diet reduces body fat in sedentary women with metabolic syndrome. Vasc Health Risk Manag. 2012;8:661-667. Chen SC, Lin YH, Huang HP, et al. Effect of conjugated linoleic acid supplementation on weight loss and body fat composition in a Chinese population. Nutrition. May 2012;28(5):559-565. Lopez-Plaza B, Bermejo LM, Koester Weber T, et al. Effects of milk supplementation with conjugated linoleic acid on weight control and body composition in healthy overweight people. Nutr Hosp. Nov-Dec 2013;28(6):2090-2098. Joseph SV, Jacques H, Plourde M, et al. Conjugated linoleic acid supplementation for 8 weeks does not affect body composition, lipid profile, or safety biomarkers in overweight, hyperlipidemic men. J Nutr. Jul 2011;141(7):1286-1291. Bulut S, Bodur E, Colak R, et al. Effects of conjugated linoleic acid supplementation and exercise on post-heparin lipoprotein lipase, butyrylcholinesterase, blood lipid profile and glucose metabolism in young men. Chem Biol Interact. Mar 25 2013;203(1):323-329. Tajmanesh M, Aryaeian N, Hosseini M, et al. 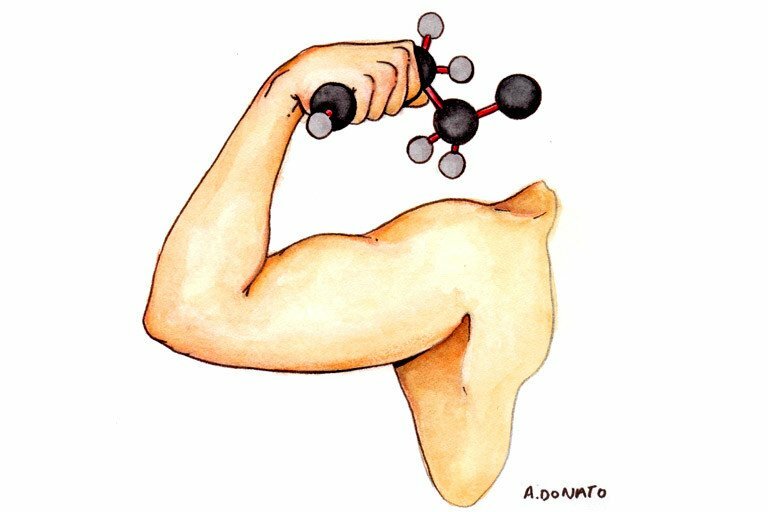 Conjugated Linoleic Acid Supplementation has no Impact on Aerobic Capacity of Healthy Young Men. Lipids. Aug 2015;50(8):805-809. Jenkins ND, Buckner SL, Baker RB, et al. Effects of 6 weeks of aerobic exercise combined with conjugated linoleic acid on the physical working capacity at fatigue threshold. J Strength Cond Res. Aug 2014;28(8):2127-2135. Jenkins ND, Buckner SL, Cochrane KC, et al. CLA supplementation and aerobic exercise lower blood triacylglycerol, but have no effect on peak oxygen uptake or cardiorespiratory fatigue thresholds. Lipids. Sep 2014;49(9):871-880. Evans NP, Misyak SA, Schmelz EM, et al. Conjugated linoleic acid ameliorates inflammation-induced colorectal cancer in mice through activation of PPARgamma. J Nutr. Mar 2010;140(3):515-521. Shiraishi R, Iwakiri R, Fujise T, et al. Conjugated linoleic acid suppresses colon carcinogenesis in azoxymethane-pretreated rats with long-term feeding of diet containing beef tallow. J Gastroenterol. Jun 2010;45(6):625-635. Mohammadzadeh M, Faramarzi E, Mahdavi R, et al. Effect of conjugated linoleic acid supplementation on inflammatory factors and matrix metalloproteinase enzymes in rectal cancer patients undergoing chemoradiotherapy. Integr Cancer Ther. Nov 2013;12(6):496-502. McGowan MM, Eisenberg BL, Lewis LD, et al. A proof of principle clinical trial to determine whether conjugated linoleic acid modulates the lipogenic pathway in human breast cancer tissue. Breast Cancer Res Treat. Feb 2013;138(1):175-183. Diniz YS, Santos PP, Assalin HB, et al. Conjugated linoleic acid and cardiac health: oxidative stress and energetic metabolism in standard and sucrose-rich diets. Eur J Pharmacol. Jan 28 2008;579(1-3):318-325. Fagali N, Catala A. Antioxidant activity of conjugated linoleic acid isomers, linoleic acid and its methyl ester determined by photoemission and DPPH techniques. Biophys Chem. Sep 2008;137(1):56-62. Cappa M, Bizzarri C, Petroni A, et al. A mixture of oleic, erucic and conjugated linoleic acids modulates cerebrospinal fluid inflammatory markers and improve somatosensorial evoked potential in X-linked adrenoleukodystrophy female carriers. J Inherit Metab Dis. Sep 2012;35(5):899-907. Tsao JP, Liao SF, Korivi M, et al. Oral conjugated linoleic acid supplementation enhanced glycogen resynthesis in exercised human skeletal muscle. J Sports Sci. 2015;33(9):915-923. Soel SM, Choi OS, Bang MH, et al. Influence of conjugated linoleic acid isomers on the metastasis of colon cancer cells in vitro and in vivo. J Nutr Biochem. Oct 2007;18(10):650-657. Basu S, Riserus U, Turpeinen A, et al. Conjugated linoleic acid induces lipid peroxidation in men with abdominal obesity. Clin Sci (Lond). Dec 2000;99(6):511-516. Ribeiro AS, Pina FL, Dodero SR et al. Effect of Conjugated Linoleic Acid Associated With Aerobic Exercise on Body Fat and Lipid Profile in Obese Women: A Randomized, Double-Blinded, and Placebo-Controlled Trial. Int J Sport Nutr Exerc Metab. 2016 Apr;26(2):135-44.